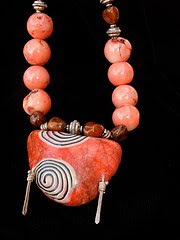 I have long admired Michele of Michele's Art Jewelry for her bold designs. I'd like to showcase some of her finest and talk a little bit about why I appreciate her art. 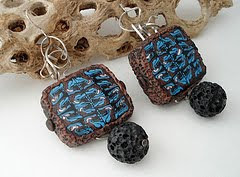 Michele spins much of her work off tribal designs and patterns. 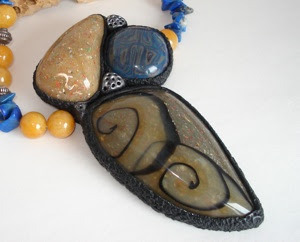 In the pendant below, she enhances some of Mother Earth's natural beauty. 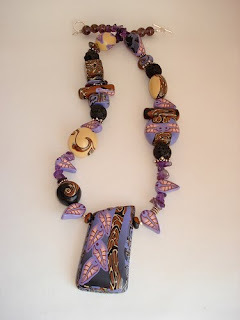 Her use of semi-precious stones is never overdone and she compliments them with her own polymer clay accent beads which make the piece so much more her own and not a puzzle of other people's work and designs. A lot of her work has an organic feel. Though the colors are far more vibrant than you'd see in nature, she blends it with such earthy components that you feel as though you might come across something like it on a hike through the woods. Her unique designs often defy the typical jewelry building of other designers, something I'm concentrating very hard on these days. 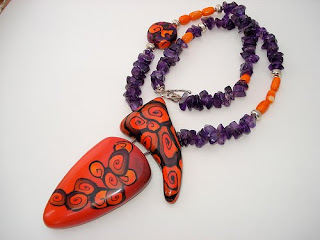 Her jewelry is not a sample of random beads and findings that happen to work well together, they are a symphony of carefully executed components that come together under her skilled hands. Keep your eye on Michele. As I scroll through her Flickr collection I am just so impressed with her ability to create. It is a joy to view and it would certainly be a treasure to own. 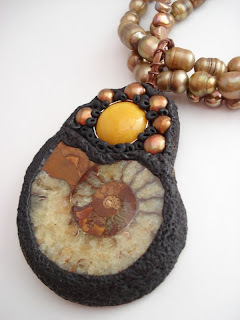 Be sure to stop by her Etsy shop and see what she is up to.